Need a low carb potato substitute? Parsnips fit the bill! Tonight was the first time I’ve tried parsnips and I must say that I’m impressed and already looking for more ways to use them. Tonight to accompany our roast chicken and broccoli I made a very simple roasted parsnip puree. 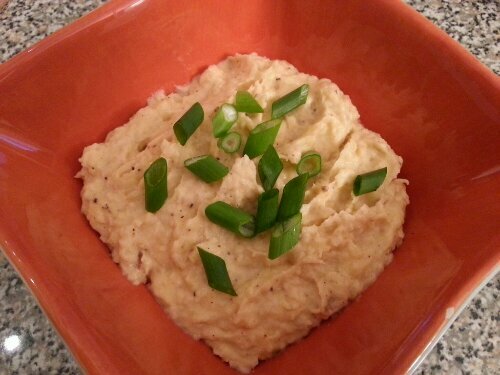 It has the same texture as mashed potatoes, even looks like mashed potatoes but the slightly sweet flavor makes them better than mashed potatoes. Here’s the recipe…. Wash & peel the parsnips. Cut into 1 inch chunks and coat with a few drizzles of olive oil and salt and pepper. Spread out on a baking tray and bake at 400 for 12 minutes. After 12 minutes, add the garlic and toss around. Bake another 12 minutes. Take the parsnips and garlic with any oil left over on the tray and put them in a blender or food processor. Add a few tablespoons of milk and butter to the blender and pulse until your desired consistency. Taste for salt and pepper, add more if needed. I served garnished with green onion and the onion with the slightly sweet flavor was very good. Next time I will add more green onion. This is a great low carb side and substitute for potatoes. This amount made 3 good size side portions. Enjoy! These low carb peppers are sure to curb your cheeseburger craving. 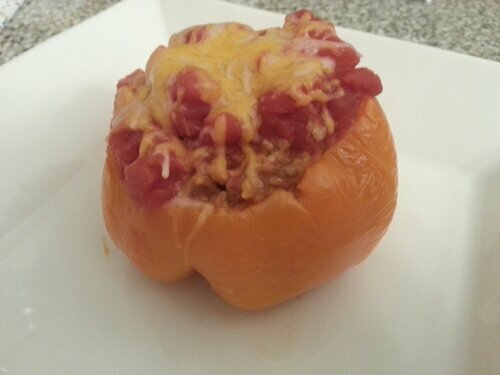 All the flavors of a cheeseburger stuffed into a pepper and cooked in your slow cooker. Cut the tops off the peppers and remove the seeds. Mix the ground beef, bacon, onion, ketchup, mustard, cheese and 1/2 cup of the tomatoes together in a bowl. Add salt and pepper to taste. Stuff each pepper with the mixture. 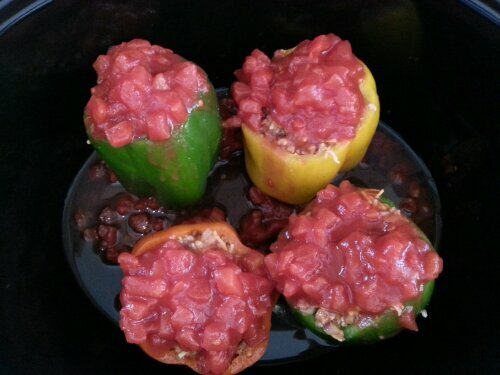 Place the peppers in the slow cooker and pour the remaining diced tomatoes and juice over the peppers. Add a few tablespoons of water to the bottom of the slow cooker to prevent burning. Cook on low for 4 hours. Top with shredded cheese before serving and enjoy! I had my oven on for dinner last night so I decided to try a new breakfast recipe. We had eaten all of our ham and egg cups I made for the week so we needed something for breakfast today. I had lots of small portions of items in my fridge that needed to be used up, along with 7 eggs. I mixed this up and baked it in a 9×9 casserole dish. Omit what you don’t like, add things you do. Substitute sausage or bacon for the ham or any lunch meat you have on hand. Use the base and make it work for your family. Whisk eggs, milk, salt and pepper. Stir in add in’s. Pour into a greased 9×9 baking dish. Bake at 400 for 30 minutes or until eggs are set and top is light brown. We are lasagna lovers in my house, my husband requested the real thing for his birthday dinner this year and he often orders it when we go out to eat. 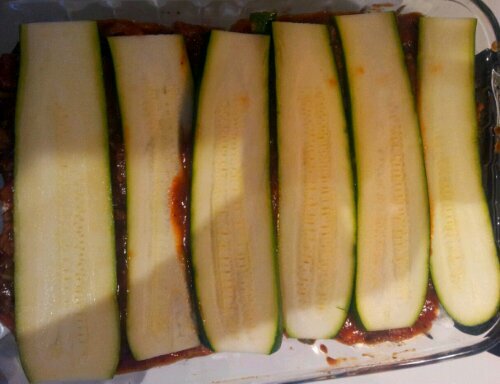 I came across a recipe for zucchini lasagna and decided to try it, it was good the first time but I followed the recipe exactly and decided my second try I would use my traditional lasagna recipe but exchange zucchini for the noodles. If you aren’t low carb and are looking for a good regular lasagna recipe, all you have to do is substitute lasagna noodles for the zucchini. I don’t like to waste, I had some small portions of veggies in the fridge and decided to use them up in the meat sauce. It added so much flavor and texture! You don’t have to use these exact veggies, I suggest you use what you have in the fridge to maximize flavor. 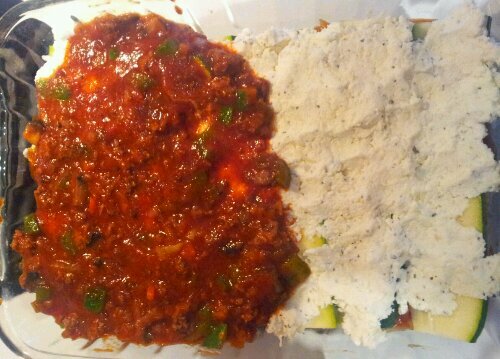 This is one layer of sauce on the bottom, one layer of zucchini, one layer of ricotta mixture and the start of one layer of sauce. This is the start of the second layer, next goes ricotta mixture, sauce, another layer of zucchini and then top with remaining sauce. Finished product! Let this sit for about 10 minutes before you cut into it. 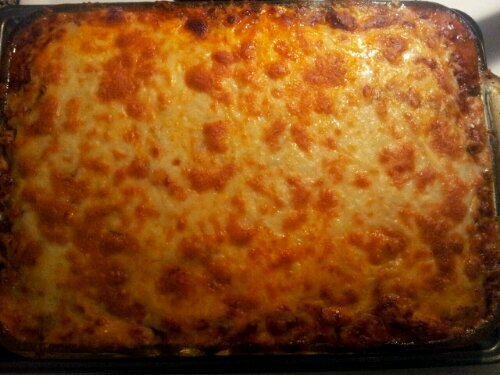 It’s a little messier than a traditional lasagna, but ohhhhhh SO GOOD! This is my low carb version of a buffalo chicken burger & french fries. I’ve been craving this ever since I let myself have the real thing on vacation. I could have done a boring chicken breast with no bun smothered in hot sauce but what fun would that be? I’ve said before that you can stuff a mushroom with ANYTHING and here’s more proof. 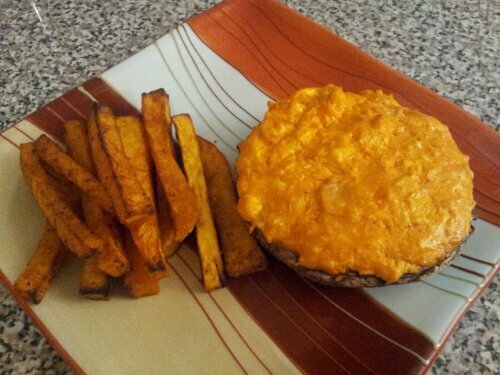 I took my buffalo chicken dip recipe (see previous post) and instead of baking it as a dip, I filled portabella mushrooms with it and baked them to a bubbly, buffalo, burger-like perfection. It was a fork & knife burger, but boy was it good! Filled my buffalo chicken craving and exceeded my expectations! I paired it with butternut squash fries….MOVE OVER sweet potato fries, these are WAY better and LOW CARB! Wipe off mushrooms with a damp towel, place on a baking sheet. Mix all other ingredients together until combined to make the filling. Fill each mushroom evenly with filling. Bake at 425 for 12-15 min until filling is bubbly. Peel the squash and cut in half, scoop out seeds. Cut each half in half again. Then cut those pieces in half so you have 8 long slices. From there make “fries” by cutting them into your desired length. Put the fries in a bowl and coat with oil and seasonings. Spread fries evenly on a cooling rack stacked on top of a baking dish (do this so the heat distributes evenly) and bake at 425 for 30 minutes. No need to flip with the cooling rack on top of baking sheet method. Use the smaller portabella’s for “sliders” or the larger caps as “burgers” would make a great appetizer too! If you like sweet potato fries, try the butternut squash fries, similar flavor but I think these are way better! Yes, you read that right, this is a recipe for low carb cheesecake. It’s similar to a “no bake” cheesecake but without the added sugar. This is light, fluffy and very satisfying for your sweet tooth. I made this last night for my dad’s birthday and everyone enjoyed it. It’s made with sugar-free jello, I choose cherry this time, but I’ve made lemon, lime and strawberry before. Any flavor you’d like would be delicious. Orange is next on my list. Here’s the recipe, it’s soooooooo easy and very good! Pulse the 2 graham crackers in a food processor until they are crumbs. Put the graham cracker crumbs in the bottom of a pie plate, spread evenly. This will be a very thin crust, just gives you a little of that graham cracker crust flavor. Dissolve the jello in the boiling water, stir well and put in the refrigerator to cool while you prepare the remaining ingredients. Put the cup of cottage cheese in the blender or food processor and blend until smooth, add the cream cheese and pulse until incorporated, slowly pour in the dissolved jello and pulse until combined (it’s ok if the jello water is still warm). Pour the mixture into a bowl and fold in one container of cool whip. Do not blend the cool whip, fold it in so it stays light and fluffy. Pour the filling into the pie plate on top of the graham cracker crumbs and spread evenly. Cover with plastic wrap and refrigerate for 4 hours to overnight. The longer it sets the more firm it gets. Slice and top with whipped cream if desired. This cheesecake melts in your mouth, it’s light, slightly sweet and creamy. Totaling around 8 carbs per slice (carb count may not be 100% accurate), this is a dessert that you can really enjoy. If you aren’t low carb, you could easily make this low-fat by using low-fat cream cheese, cool whip and cottage cheese. Would be delicious topped with fruit! Check out my other low carb sweet treats here…..
It’s my dad’s birthday today (Happy Birthday Daddy), and for the last 6 or so years I have made him a home cooked birthday dinner. We usually have Chicken Capri, it’s his favorite dish from a local restaurant and I love it too. I’ve adapted the recipe to make it as low carb as possible. I think changing it has added more flavor and everyone loved it tonight, as usual! 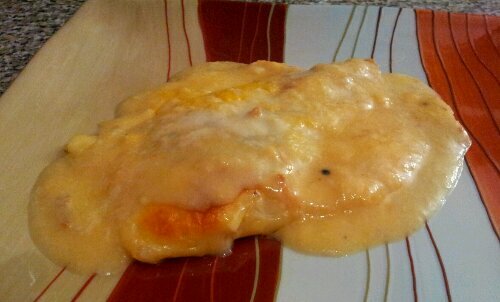 It’s easy to make and smothered in a white wine and cheese sauce….Mmmmmm….here’s the recipe. 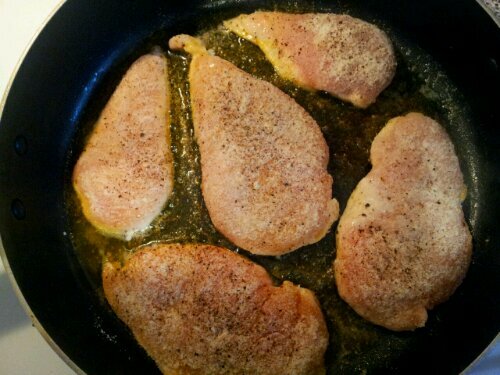 Cut lemon in half, juice one half into a bowl, rub the other half on both sides of each chicken breast. Season chicken with salt and pepper. Pour 1/2 cup of parmesan cheese in a shallow dish and dip each chicken breast in the parmesan cheese until lightly coated. Brown chicken on both sides (do not cook thru). While chicken is browning, mix the wine, cream of chicken soup and left over parmesan cheese from dipping the chicken with the lemon juice from earlier. You must use the parmesan cheese in this dish, it has touched raw chicken and must be cooked in this dish or thrown away. I usually add a few more shakes of parmesan for good measure 🙂 season the sauce with a little pepper. 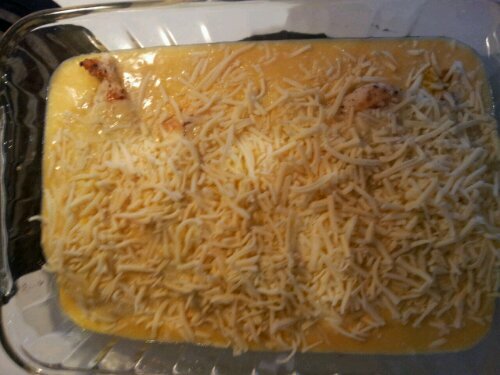 Once the chicken is browned, put it in a casserole dish, cover with sauce, top with provel cheese, cover with foil and bake at 350 for 25 minutes. After 25 minutes, remove foil and let bake another 5-10 minutes until the cheese and sauce are bubbly. I traditionally serve with broccoli and a salad but if you aren’t low carb, make some kind of bread to soak up all of that delicious sauce! 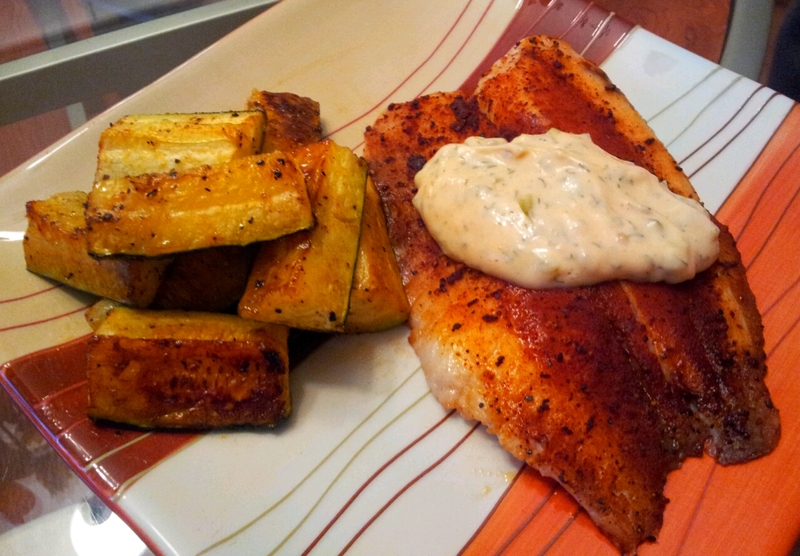 This is my go to blackened fish recipe, and I made roasted zucchini for the first time with it and O.M.G its my new favorite way to eat zucchini! Serve these two items with a salad and you have a delicious and filling low carb dinner! Homemade Blackening Spice – Equal parts of each ingredient, for this recipe 1 tsp of each will be enough, you may have a little left over. Garlic salt, black pepper, onion powder, paprika, cayenne pepper (1/2 tsp of this if you don’t like spicy). Mix together well. Serve with fresh lemon wedges or homemade tartar sauce. Homemade Tartar Sauce – 1/2 cup mayo, 2 tbls miracle whip, 2 tbls sweet relish, 1 tsp hot sauce, 1 tsp dill (dried or fresh), 1/4 tsp garlic salt, 1/4 tsp onion powder, squeeze of fresh lemon juice. Wash & dry zucchini, cut in half, then cut in half again and cut those wedges into thirds (like large french fry shape). Mix seasoning together and coat zucchini with oil and seasoning. Spread evenly on a baking sheet and bake at 425 for 10 minutes, turn and bake an additional 10 minutes. Season with sea salt if desired. These have a fried zucchini taste but without the carbs and guilt! I’ve said it before, you can stuff a pepper with just about anything! I love green peppers and they are great for stuffing with whatever your heart desires. 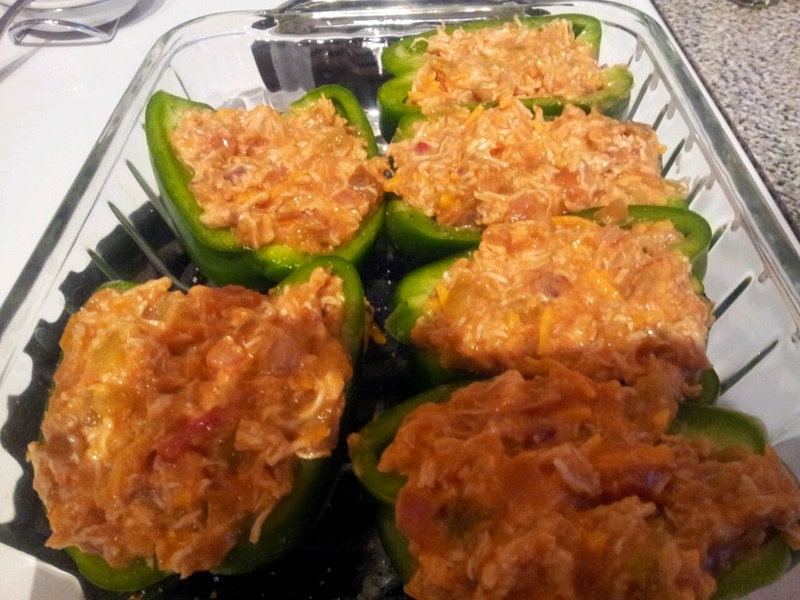 My inspiration for these stuffed peppers came from a dish that my Mother In-Law makes called Chicken Sopa. It’s a Mexican layered casserole dish with a similar filling that I use in my peppers but it also has corn tortilla’s which unfortunately don’t fit well with our low carb lifestyle. 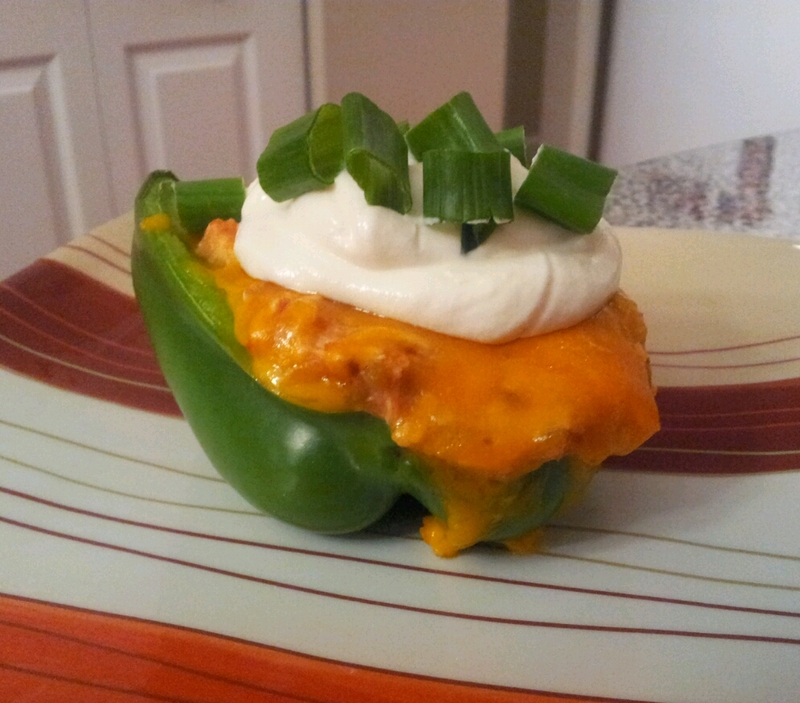 You can take any dish you love and turn it into a stuffed pepper, the possibilities are endless! Wash and dry the peppers, cut them in half long ways and remove the seeds and stem. Season with salt and pepper and put in a baking dish. I like my peppers with a little crunch when they come out of the oven, I don’t want them to be soggy. Depending on how you like them will determine your next step. If you like your peppers soft them put them in the oven now for 10 minutes while you mix your filling, if you like them with a little crunch then don’t pre-bake them (I don’t pre-bake mine). 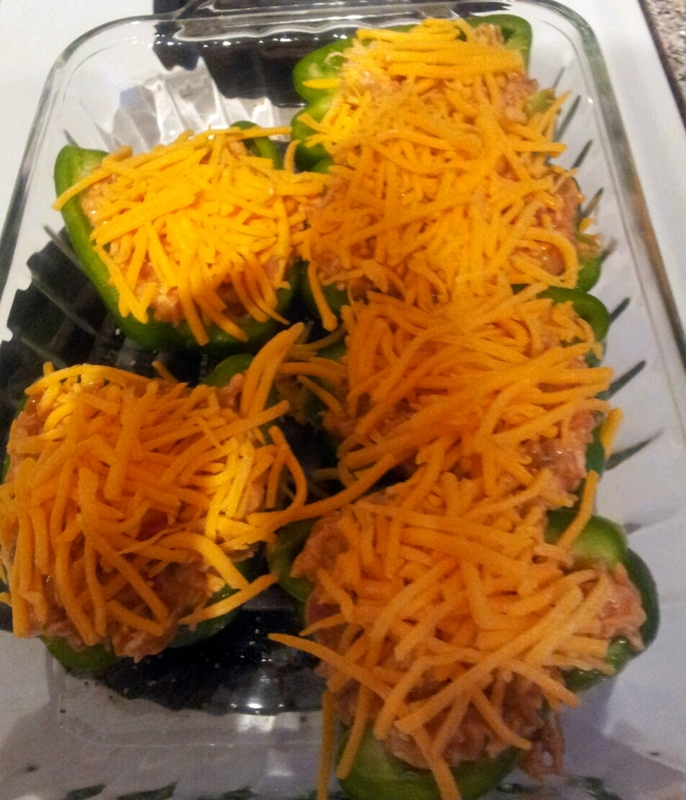 Mix all of the other ingredients for the filling, leaving 1/2 cup of shredded cheese to top the peppers with. Once you have them filled, top with the remaining cheese and cover with foil. Bake at 400 for 40 minutes then remove foil and bake an additional 5-10 minutes until the cheese is bubbly. 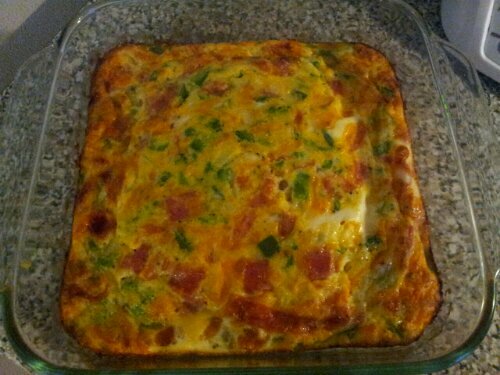 Top with scallions and sour cream, serve with a salad and ENJOY! I’ve been asked many times what I do when I’m craving something sweet, I do get hit by my sweet tooth every now and then and unfortunately my low carb lifestyle and sugar do not mix. There are some low carb protein bars, chocolates, etc that are sold in stores but I find them to taste very fake and not to mention the hundred ingredients that are in them, half of which I can’t pronounce. When I’m craving something sweet I stick to satisfying options and very small potions. Here are my suggestions…. 1 tbls of all natural peanut butter (4 carbs per tbls) and about 7 milk chocolate chips (2 carbs for about 7 chips) = 6 carbs. Peanut butter is full of protein, healthy fats, potassium, fiber and antioxidants. Peanut butter also helps you feel full. Peanut butter and celery is also a good snack. If you have a peanut allergy or just prefer the flavor of almond butter better than peanut butter, it has about the same amount of carbs for one tbls and almonds are also very good for you, giving you protein, vitamin e, magnesium and fiber. 1 tsp of honey has about 5 carbs, yes this is a much smaller portion than the peanut butter, but honey is very sweet, I don’t think I could eat more than a tsp anyway. Honey has so many health benefits. You are killing two birds with one stone if you pick this as your sweet snack. See my post about the benefits of honey to discover all of its health benefits. Sugar free jello has zero carbs. Top with a little whipped cream to make it extra delicious. 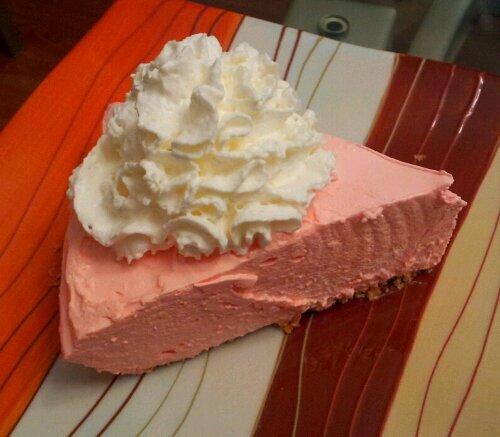 I have a great recipe for a low carb jello cheesecake, I promise to share it soon! Cream cheese – Two tbls of cream cheese has about 1 carb. You want the regular cream cheese, low fat and fat free cream cheese is much higher in carbs. I happen to love cream cheese and can eat it plain, but you can also whip it with a tsp of honey and have a sweet and creamy dip for anything you desire. Cream cheese and celery is also a good snack. I find any of these options very satisfying for my sweet tooth and I hope they help you out too. Share your low carb snacks with me, I’d love to try them! 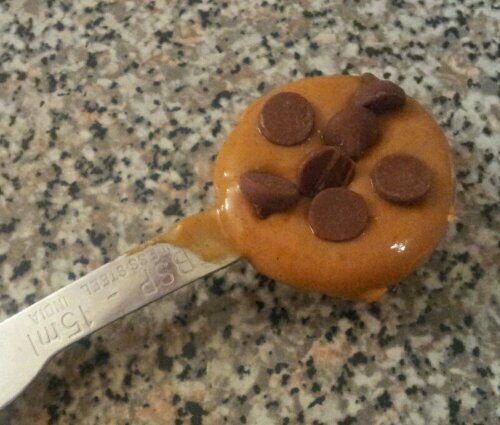 Check out my other low carb sweet snacks here…..